This is a project by The Spent Goods Company who learned about how 6 Billion pounds worth of spent grains ends up in the US landfill every year. That’s the equivalent of being able to feed every American a loaf of bread every week for almost 1 year. 185,000,000 Kg of spent grains end up in Ontario’s landfills, resulting in methane and carbon dioxide, contributing to the province’s GHG emissions. While larger breweries divert their grains as animal feed, urban craft breweries produce too little in comparison to financially justify pickup or deliveries to nearby farmers. With craft breweries growing 25% every year in Ontario, The Spent Goods Company is working with forward-thinking breweries and locals to find a win-win situation for all. For Locals – Enjoy delicious tasting bread, made in Toronto that is also healthier for you. Good for the Planet – You have directly reduced greenhouse gases by diverting leftover grains that typically end up in the landfill. Locally sourced, certified organic wheat flour, brewery barley grains, water, non-commercial yeast and salt. Made using a wet dough and long slow natural fermentation to increase nutritional value, flavour, and digestibility. Organic + Local: Sourced locally using traditional stone milling techniques to preserve the integrity and unique character of the grain. 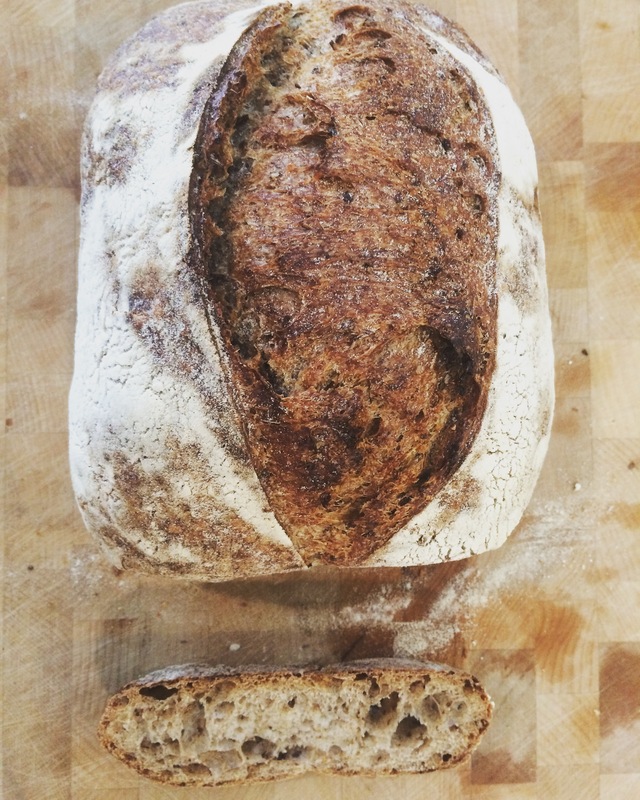 We build a mature starter (aka levain) for approx. 10-12 hrs with a 10% inoculation. While the young levain ferments, we mix the flour and water in the recipe together and let it hydrate (autolyse). Once the young levain is sufficiently developed it’s incorporated into the autolyse and the dough is mixed. Salt and additional water are added toward the end of this process. Then the dough ferments at room temp for 3-4hrs and is folded onto itself at regular intervals. Once the loaves are shaped, they go into a fridge for a cold proof lasting roughly another 10-12hrs before baking. Now, do see why it tastes so good? Good for your Health – Considered one of the healthiest whole food grains. Studies show it’s protective against Breast Cancer, Type 2 Diabetes, Gallstones, Heart failure and lowers cholesterol. Good Nutrition – Double the fiber and protein; Less gluten (but NOT gluten-free) and low glycemic compared to white flour bread.